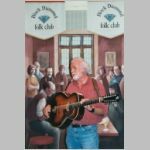 Bill Caddick hails from the Black Country and this can be heard in many of his songs, mostly self penned, but he can’t be pigeonholed quite as easily as that, as many of his CDs can testify to a wide-ranging catalogue of songs about places and people. The great and the ordinary love and record Bill’s songs, but to have him in the room singing them to you is the best way to hear them. Come early as he is always very popular.